Could Facebook’s Influence Impact Voter Turnout? With 1.3 billion users, Facebook is already impacting elections in a measurable and significant way. As it has done in previous years, Facebook has encouraged users in the U.S. to vote and also to post the fact that they voted. This simple button has raised some questions about the impact of Facebook on elections, and it seems the impact is both measurable and significant. 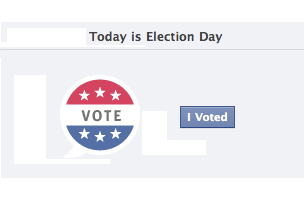 Facebook used an “I voted” button during the 2010 midterm elections, and users who were told that their friends had voted were 0.39 percent more likely to vote. This doesn’t sound all that significant, but the “I voted” button may have been responsible for an additional 600,000 votes during those elections (at least that’s what Facebook thinks). This swing could easily change the results in an election, especially if another situation like Bush v Gore were to arise. What may be more insidious is the possibility that Facebook decides to use this election swing for its own purposes. “Digital gerrymandering occurs when a site instead distributes information in a manner that serves its own ideological agenda. This is possible on any service that personalizes what users see or the order in which they see it, and it’s increasingly easy to effect,” writes Harvard Professor Jonathan Zittrain. Facebook is already influencing elections, just by the nature of its audience. “Social networks skew young and female: two reliably progressive-leaning demographics. Even if Facebook distributed the button equally to its users, it might still bring more liberal users to the polls than conservative ones,” writes Robinson Meyer, an associate editor for The Atlantic. With 1.3 billion users, Facebook can’t help but influence elections. However, there is something important to note: Facebook is increasing voter turnout in a time where the electorate seems to be voting less. When turnouts decrease in the future, as they very well could, we might be happy Facebook is encouraging people to get to the ballot box.